Having immaculate skin is something that nearly everyone dreams of, surely, even men. So I've decided to relay some fantastic tips that I picked up whilst in London last week. 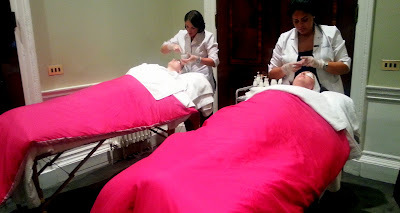 I was lucky enough to be invited to a Murad skin care event. Now if you haven't heard of Murad, it's probably because it's not that big in the UK , yet! The founder, Dr Murad is from LA and he and his son Jeff, actually flew over to do this event for us. I have only recently heard of Murad and when I did hear about it, I researched it online and figured that it is quite similar to Dermalogica. Now If you read my blog you'll know that I adore Dermalogica and how it's changed my skin, so I was very excited that another brand so similar were hosting an event, I wanted to find out what sets them apart from each other and which is the better brand. 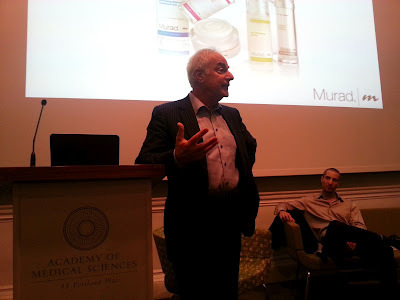 However, instead of raving about how incredible his brand is, Dr Murad actually gave us a motivational speech, one of the, if not THE best motivational speeches that I have heard in a long time. I think he should give Murad to his son Jeff and become a full time public speaker, as he really is an inspirational guy. So, what is it that he told me that's made me so inspired? Get ready for the top skin care tips! It's very difficult to translate what Dr Murad told us into pictures, so I took some photographs of the slides which I thought were most useful and have put them into a collage format above. Murad started the talk by asking us 'who is the most important person in your life?' Of course, answers were 'My Mum' 'My Brother' but then he told us, No, that's not correct, the most important person to you, is yourself. Now I'm not sure I fully agree with this, as my family are 100% more important to me than myself, I would put them before me in anything I do, but what he was getting at is that, we look after our families,our friends so well, so why don't we look after ourselves as well as we look after others? He ordered us all to 'buy a crown' in fact 'buy 5 crowns, all in different colours, one to go with each outfit' and said that we are all Queens and Kings. This was a really nice ice breaker and there is some truth in what he was saying, we sometimes spend so much time worrying about the people around us, that actually, no wonder our skin has daily wear and tear. Cleanse your skin before bed - This is an obvious one that you've probably read in millions of places. We all know that we need to do it, but sometimes it's just too tiring however, he told us that without this proper cleansing, bacteria is able to survive on the skin, thus leading to breakouts and if we don't cleanse on a night, our skin doesn't have chance to repair itself whilst we sleep. All the things we encounter in the day, such as pollution on our skin, need to be washed away to avoid tissue damage which leads to ageing. Okay. I am ALWAYS going to wash my face before bed now. Toners ARE important - I don't think many people understand the role of toners, you can get toners for everything and anything. I am currently using my tea tree oil toner from Lush at the moment and will be reviewing this very soon. I also use a Dermalogica toner for hydration. Murad said if you 'want beautiful skin, use a toner' he also said that they help to absorb your products deeper and faster and they refine pores. What's not to love? Plus they take a minute to spray on the face. Oily skin needs moisture too - This is interesting, because my skin varies depending on the time of the month and the weather and I never moisturise if it's oily. I only found out recently that you need to moisturise oily skin. Why? Because moisturiser doesn't add oil to the skin, it adds water... interesting. 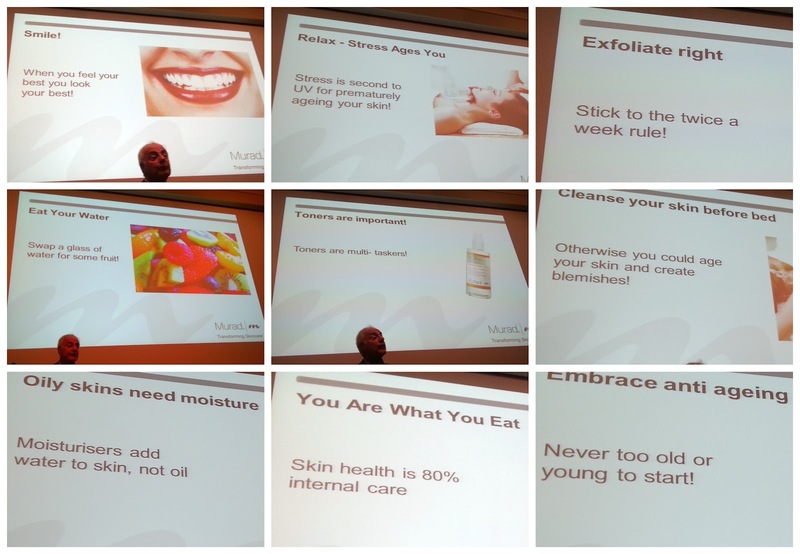 Embrace anti-ageing products - This is going to shock everyone, because everyone moans when they're given an anti-ageing product in a beautybox and so forth, but Murad said, if you use anti-ageing products from as young as you can (I mean, technically we start ageing the day we are born), you will prevent the ageing process. It's a lot easier to prevent the ageing process than to correct it once you've started ageing. This interested me a lot although I can't see myself using a full range of ageing products just yet. EAT YOUR WATER - This is the main point that he raised. Murad is big on water, and understands that your skin needs water to repair the cells, therefore, water is essential to life and essential for good skin health. He said to replace a glass of water with raw fruit/veg as it hydrates the skin from within. Whilst water passes straight through you, fruit is absorbed by every cell in the body. Bring on the watermelons. Exfoliate right - On the photo it says no more than 2 times a week, but Dr Murad himself said that is just a basic rule so that you don't do it too much or too little, I do it every day as I use Dermalogica's Daily Microexfoliant and it is an unbeatable product as far as i'm concerned for daily exfoliation. Relax! Stress ages you - He said that skin care is about what you do and how you feel emotionally, so if you are happy emotionally, your skin should show it. Try to de-stress and pamper and you'll notice a difference straight away. Be imperfect - Live Longer - He said that if you are hard on your self every day, you will become stressed, he said just be imperfect once in a while to get rid of that stress. You are what you eat - of course, we have heard this so many times but it's difficult to take note of. He said if we eat good 80% of the time, we are allowed to junk out and binge 20%, because he said brfore food there was CHOCOLATE and if we are constantly thinking about chocolate we will just become stressed and eat more, so let yourself eat whatever you want 20% of the time. Pizza for me every weekend then! Finally, SMILE - It actually releases androgens into the body which have been proven to make you happy. So as you can see, he gave us some amazing tips but also life skills! I'm happy that I got to relay these to you as I've always been looking for a list of skin tips. If you're wondering what skin products I use you can read my post on it here. After the talk we were all treated to fabulous facials, I never have facials but the man himself actually said that they are extremely beneficial for the skin and I did notice a complete change in my skin after my facial, so much so that I actually walked through central London afterwards completely bare faced. We of course, didn't leave empty handed and were each given a cute goodie bag/box with our chosen products in. I asked the facial lady what to get and she recommended the blemish control kit as that's all I care about really. I did have a session with another lady who took a photo of my face and then told me what is wrong with it;it just said I have a lot of dryness and pigmentation which is something I never realised. I will just have to moisturise more. I have used the products above every day since I received them and will be letting you know how I get on very soon. He told us that it can take 4 weeks to see a real effect from skin care as that's when the skin turns over, so i'm going to give these products a proper chance. However, I have noticed results from the T-Zone pore refining gel already which is absolutely incredible. 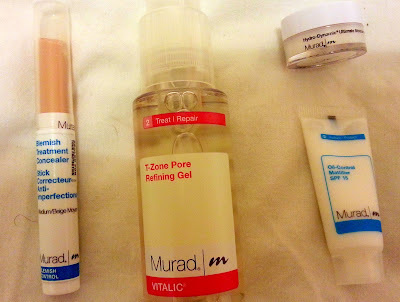 Have you used Murad products? What are your fave skin care products? Do you have any skin care tips? Thanks for the useful advice. These are absolutely fantastic tips! Thank you so much for sharing them! He was also in the Netherlands last year. With the same presentation, I think. he was sooo nice, i want him to be my dad, he was sooo inspirational! oh wow, did you see that? so nice blog i like it . Really nice tips! thanks for sharing! Absolutely love your blog! My kind of blog read, for sure. Congratulations on the Cosmo win! That's so awesome. I'm following now :) Please check me out if you have a chance. Amazing tips.. I love finding out more about skin care. Feeling inspired to do a bit of skincare shopping!! § On a daily basis, these skin products include good quality cleansers, toners and moisturizers etc. High quality face masks and serums can also help improve the skin texture in the long run. Skin Care Tips are always appreciated by woman.and being a woman i will also love to follow this tips. Many people of a certain age strive to do as much as possible to delay signs of aging through a variety of skin care products and treatments. Being the largest organ of the body the skin, is of course, the place where the signs of aging generally become highly visible to the world, despite our best attempts at camouflage. Thank you for this great article about skin care tips. there is not too much information out there about mens skin care tips that are not just product reviews. I am looking for a full system or method that will help me cure my acne or at least help my skin look a lot better. Skin care indeed requires effort and not to mention resources. If you're really committed to having healthy, youthful skin then you'll do anything just to get what you want.